The internet hosts many sites dedicated to the documenting or tracing of lost, destroyed, or stolen works of art. Those that are regularly updated can be rich sources of provenance information, some of it late-breaking news involving ongoing court cases or investigations. Any of the following resources will lead to many more, collectively providing a wealth of information on lost and missing works of art, art recovery projects, documentation of lost and missing art, art restitution projects, and much more. Archives of American Art. Guide to Commercial Art Gallery Records. Many of these collections contain financial records, correspondence, and photographic documentation of objects acquired and sold in the twentieth century. Microfilm of these records can be requested through Interlibrary Loan. Getty Research Institute. Nazi-Era Research Assets. Links researchers to archival materials consisting of descriptions of records and, in many cases, digital images of the records that relate to cultural property that was stolen, looted, seized, forcibly sold, or otherwise lost during the Nazi era. These records, which are in many different languages, include Nazi documentation, governmental records from 1933 onwards, inventories of recovered artworks, post-war claims records and auction house and art dealer records. The world's largest private database of stolen and missing works of art and antiques. Includes numerous records for works looted from public and private collections between 1933 and 1945. A project of the World Jewish Congress dedicated to reuniting works of art looted by the Nazis with their rightful owners or heirs. The Project for the Documentation of Wartime Cultural Loses, based at Loyola University, compiles digitized copies of important documents relating to the theft and recovery of cultural property. Einsatzstab Reichsleiter Rosenberg (ERR), the “Special Task Force” headed by Adolf Hitler’s leading ideologue Alfred Rosenberg, was one of the main Nazi agencies engaged in the plunder of cultural valuables in Nazi-occupied countries during the Second World War. This database brings together for the first time in searchable illustrated form the remaining registration cards and photographs produced by the ERR covering more than 20,000 art objects taken from Jews in German-occupied France and, to a lesser extent, in Belgium. 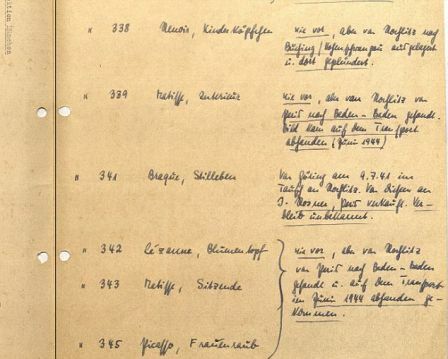 Searchable by individual objects and by the owners from whom these objects were taken, the database is a detailed record of a small but important part of the vast seizure of cultural property that was integral to the Holocaust. The commission responsible for all matters relating to Nazi looted art and other cultural property in Europe. Assists families, communities, and institutions with the research, identification, and recovery of looted cultural property. 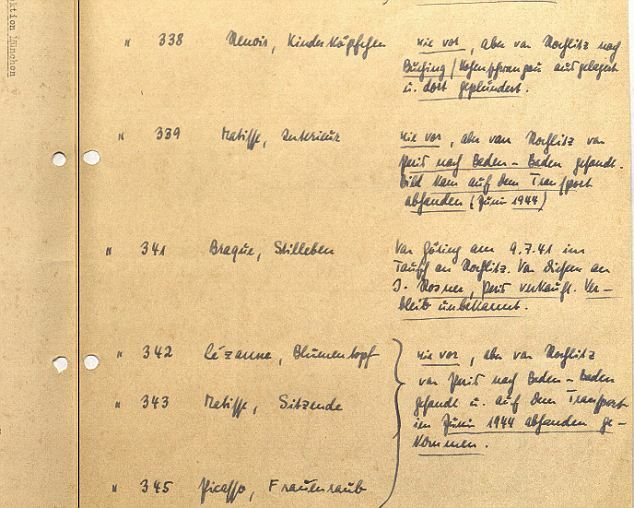 A project of the Federal Government of Germany and the federal states of Germany for registering cultural assets that were relocated, transported and, especially with regard to Jewish citizens, confiscated as a result of their persecution during World War II and the Nazi period..
A searchable catalog of 2,000 unclaimed works of art recovered after World War II, and held in the care of the National Museums of France. Nazi-era record, from a collection of records from 1940 to 1945 that have been digitized. On this page are listed a study of children's heads by Renoir, a still life by Braque, a vase of flowers by Cezanne, and a work by Picasso. This page can be found in the ERR Project database, an important art restitution project at the Jeu de Paume, among the resources listed at left. 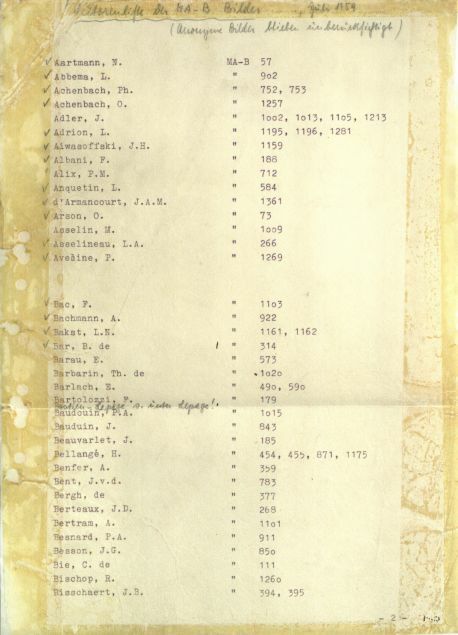 Also from the Jeu de Paume's ERR Project database, the first page of an inventory of paintings seized in the Paris region from abandoned Jewish lodgings by the Möbel-Aktion, or M-Aktion (coded “MA-B”).